cat haee – Publisher and Creator of trilogy series “Haee and the other middlings"
Newly launched book “Haee’s Quest for the Greater Prairie” received another 5 star book review rating from Readers’ Favorite. Read and reviewed by readers, this 3rd book from trilogy series “Haee and the other middlings” is an endearing and poignant story about a cat’s life in a middling city. Through the eyes of black cat Haee, this final book sums up what many of us experience in life’s various stages – our constant thirst for the extraordinary mostly, out of boredom and curiosity; only to culminate in a much poignant view on a somewhat very un-extraordinary middling life. Read full review at http://readersfavorite.com/book-review/14013. Watch book trailer at http://www.youtube.com/watch?v=KocLs1twAU4. This is an interesting book, focusing on the ideas of need versus want, what is self-fulfillment and exploring our motivations. It’s a short read, interspersed with beautiful images of Haee and the other characters. I’m not sure that I really ‘got’ this book on the first read, and I suspect it is one of those books that you can turn to again and again and find different things, dependent upon your mood. It is thought provoking as we see the human characters stuck in a life they think they should lead, rather than the one they want to lead. I suspect that a young adolescent would take the most from this book as they sit at a crossroad in life, making choices that will impact their future. All in all an intriguing, well designed ebook. It is well edited and a well thought out and put together package. Another wonderfully illustrated book from R.S. Vern, again following the life of Haee, the middling cat…. This book again observes those that are not quite pursuing a ‘normal’ life but also looks at the consequences of everyone being a middling… it doesn’t quite work, everyone (and thing) has a place in the world, and they contribute, each in their own way, no matter how trivial that contribution may be! The images in the book are again wonderful, and really capture the idea of Haee and his other friends. Certainly a quick and easy read that will provoke different ideas each time you pause to read it. To read more, please go to http://akindleandkittens.wordpress.com/2013/02/19/r-s-vern-two-ebook-reviews/. Verdict: HAEE is a beautifully illustrated and thought-provoking modern-day allegory suitable for older children and grown-ups alike. This is the simple but poignant story of Haee, a cat with a crooked tail who lives a comfortable and worry-free life with his loving family. One day, curious Haee goes exploring in a black hole and gets lost. Haee is discovered by Tom and Jane. Tom and Jane take Haee home and give Haee everything he could possibly need or want. Though they appear to be a perfect couple living a perfect life filled with good jobs, exercise, organic food, sleep, a nice car and everything they need, Tom is secretly dissatisfied with the busy urban life and wishes for clean fresh air and Jane wishes she were a bird and could fly away and see the world. Haee, in spite of his pampered life, treats and his part in making the house run smoothly, discovers that he, too, is missing something. So one day Haee decides to go play with the cats in the alley and make friends with Whie – the one cat that all the other cats ignore because of her big red nose. Haee enjoys being with Whie so much that he does not return to Tom and Jane. Haee, Tom and Jane are all Middlings who appear to have everything they could possibly need and want to be comfortable. But, as the evocative and enticingly detailed pen-line illustrations show, there is an underlying sense of dissatisfaction that grows in spite of all “needs” being met. Realizing this, Haee acts on his desires leaves the comfort of home in search of more satisfying life. The ending comes somewhat abruptly, leaving a sense that the story is incomplete, however Vern does effectively brings to light the question about whether or not having it all is really the paradigm for the middle class working Tom and Jane, and whether Haee, or any other Middling, is really living more if they are less “comfortable”. Vern’s story is engaging on many levels and the mostly-black-and-white illustrations add a contemporary and stylish elegance to the clean, crisp layout of the ebook that also features pop up text boxes when narrative is double clicked. HAEE is a beautifully illustrated and thought-provoking modern-day allegory suitable for older children and grown-ups alike. Reviewed by Maya Fleischmann for IndieReader. 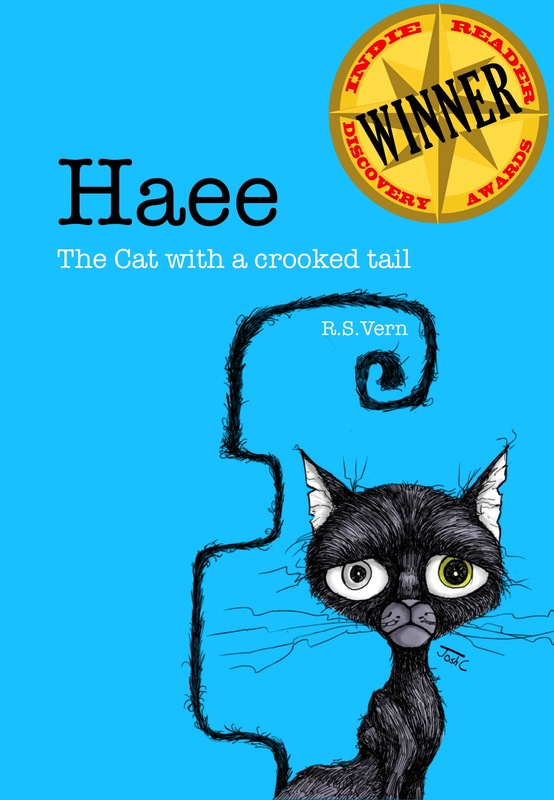 To read more, please go to http://indiereader.com/2013/02/haee-the-cat-with-a-crooked-tail/.